I’m not usually a fan of slapstick comedy in any language, but despite the entire complement of comedy uncles and plenty of farce, I really enjoyed Hanuman Junction. The story is nothing new but it’s entertaining and well told, with some good performances from the main cast. Although not all the comedy works, there is enough that does to make this a funny film and there is plenty of drama and the usual fisticuffs to add in to the mix. It’s actually a remake of the Malayalam film Thenkasipattanam which may be partly why it’s one of the better comedies I’ve seen. The story follows two young orphans Krishna and Dasu who, along with Dasu’s little sister Devi, enterprisingly set up a business together in Hanuman Junction. However the seeds of a life long feud are sown when their fledgling shop is destroyed on the orders of local boss Devudayya (Jaya Prakash Reddy). On the advice of their mentor, the two decide to fight back and over the next 15 years graduate as fully qualified thugs themselves. By means of their fists and general belligerence they manage to depose Devudayya and rule over Hanuman Junction while running a successful carrier business – JD and Company. For Krishna (Arjun Sarja) and Dasu (Jagapathi Babu) nothing matters more than the other’s happiness and the two have a fine bromance together which rather disturbingly involves wearing matching outfits a lot of the time. Krishna is the more likeable brother and Arjun has plenty of charm as seen before in Sri Anjaneyam. Jagapathi Babu is fine as Dasu but seems a little more stilted in comparison. His character is also darker than Krishna’s and without that lighter mood he often appears to be little more than a plain thug. They both resort to fighting to resolve every little issue, often appearing to go out looking for confrontations. However the two work together well and show that it’s necessary to keep your buddy with you at all times when fighting – even if you have to get your friend out of a hospital bed and carry him on your back to the fight! 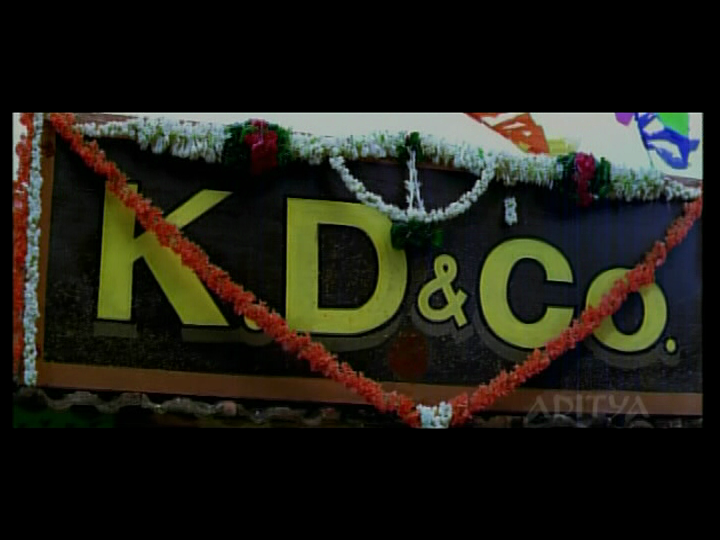 Enter Sathru (Venu Thottempudi), a new manager for KD and Company who has designs on Devi (Vijayalakshmi) and a novel approach to winning her hand. After stalking Devi through her years at college (which we know is a sure sign of true love), Sathru has a plan to civilise the two brothers in the hope that this will impress Devi enough to marry him. Devi seems to have been worn down by Sathru’s perseverance or perhaps it’s just that she hopes his plan to calm her brothers down will actually work since she’s not impressed at all by their rowdy ways. Sathru’s idea involves getting the two brothers married as he thinks that a wife and children will act as soothing influences, or at least not give them any time to go out fighting which is probably more likely. I liked Venu in Gopi Gopika Godavri but his character is a bit more hit and miss here. Sathru is played strictly for laughs and the comedy relies very heavily on him getting slapped around by everyone. From time to time this is mildly amusing but his hapless scheming is much funnier and works better, especially later in the film. Sathru doesn’t have to work very hard to find a candidate for Krishna’s wife. Meenakshi (Sneha) is Devudayya’s adopted daughter and she has had an understanding with Krishna since they were kids. But while Krishna is happy to let their relationship evolve slowly, not wanting to let her relationship to Devudayya upset Dasu, Meenakshi is keen to get her man and is not averse to taking matters into her own hands. I’m not very sure what a good day of butterfly romancing is, but Meenakshi is determined to have one. Luckily for Sathru’s plans, the two brothers’ inept handling of a festival results in singer Sangeetha (Laya) being thrown out of her uncle’s house. As Devi decrees that Sangeetha can stay with her until she decides what she wants to do next that gives Dasu a potential bride and Sathru plots to get the two together. But nothing goes to plan as Sangeetha declares her love for Krishna and Dasu mistakenly thinks that Meenakshi has been selected as a suitable wife for him. More great lyrics in this song! In the middle of all this farce, Davudayya is trying to win back control of Hanuman Junction and destroy the two brothers once and for all. There are more fight scenes, plenty of melodrama and the comedy of errors becomes more and more convoluted with the only sure thing being that Krishna and Dasu are more devoted to each other than to any of their prospective brides. It’s all wonderfully silly and there are some genuinely funny moments and good one-liners. Every single possible Telugu comedian seems to have been roped in, but their roles are kept to a minimum which keeps their antics under control. Brahmi is in good form as Sangeetha’s uncle and Kovai Sarala goes totally over the top as her disapproving aunt. Ali, LB Sriram and MS Narayana do their usual thing but in a more restrained manner which makes them reasonably amusing and I didn’t find it necessary to use the FF button at all. There is one protracted skit involving a comedy cow which overstays its welcome, but otherwise I found most of the confusion between the prospective couples quite funny. The comedy works for me as the underlying story itself is amusing and the slapstick and comedy uncles are just window dressing rather than the main event. While Arjun and Jagapati Babu have reasonably well-developed roles, the women overall are given much less to do. Meenakshi is the best of the female roles and Sneha makes the most of her irrepressible and mischievous character. Sadly even her role is reduced in the second half of the film but her interactions with Dasu are among the funnier moments. Laya is very restricted in a role that doesn’t require her to do anything other than generally mope around while Devi appears on-screen even less. The songs don’t stand out in any way, but I do like the choreography and the picturisation which seems to suit the village style of the film. the choreography is credited to Lawrence and Dinesh which perhaps explains the exuberant quality of some of the steps. Suresh Peters apparently reprised the music from his Malayalam soundtrack and apart from some rather odd lyrics the songs fit well into the main narrative. I love the way this song seems to have been filmed with a group of locals who just happened to be standing around with nothing better to do one day so were rounded up for this clip. Plus there is some excellent uncle dancing from Arjun and Jagapathi Babu. As I‘ve written before, comedy is the hardest genre to understand in a foreign language and I’m sure that I missed a lot of the references here even without the added issue of dodgy subtitles. But Hanuman Junction is still a funny film and so far tops my list of good Telugu comedies – not that it’s a very long list! I think it’s worth a watch for Arjun and Sneha and for an updated version of the Sholay-style friendship between Krishna and Dasu. You can always FF past all the really stupid slapstick. 3½ stars. I loathed almost every second of this excruciatingly unfunny and stupid film. I’ve been on quite strong painkillers for a week and I watched this for a second time in the hopes that it would improve under the influence, but no. The director seems to think that if someone falling over and landing with their head in a bucket once is genius, how hilarious will it be if they do it over and over? And then applies that logic to EVERYTHING. Slapstick can be really funny, and so can running gags, but this film is so heavy handed and witless I just groaned. Normally I’m all for two men in a cow suit, but even that was belaboured and went on and on and on. There was too much repetition and overuse of standard jokes, pratfalls and sight gags, so even the mildly amusing stuff lost its appeal very quickly. None of the actors impressed me, and I was disappointed to see Jagapathi Babu and Arjun wasted in such unlikeable roles. 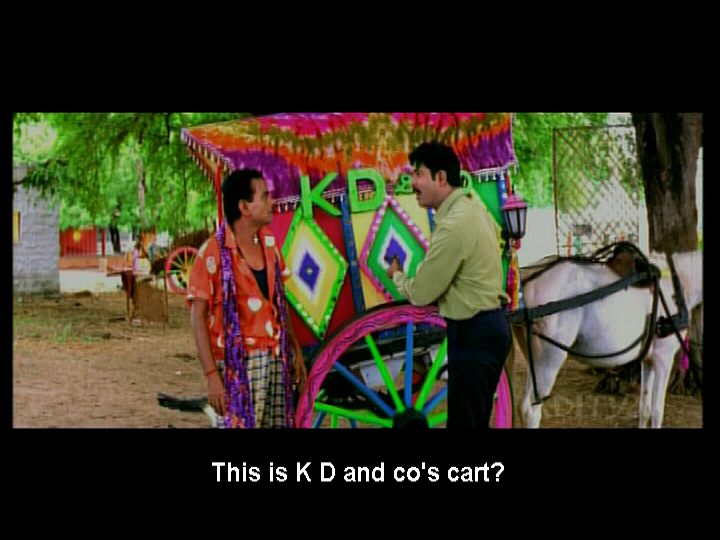 Krishna and Dasu’s relationship was straight out of the tin labelled ‘generic brand filmi bromances’, and I found it very unengaging. Arjun as Krishna has almost no personality until very close to the end of the road, and by then I was over it. Jagapathi Babu’s Dasu is an aggressive alcoholic bully with few saving graces, and yet is supposed to be a sympathetic character. His ‘romantic’ dilemmas were not well developed (‘Oh you love my brother, so then I pick HER’ is about the sum of his emotional journey), and his reactions seem all out of proportion. The romances are not well developed and none of them convinced me in the slightest that it was genuine attachment and not a sense of entitlement or something, so I couldn’t care less about the outcome. Although I was pleased to see Sneha in actual clothes (not skanky item apparel) and looking quite pretty for a change. There was little effort placed into writing the story or making any of the characters more than caricatures, so the actors were at a disadvantage from the get go. It’s just a mish mash of brawls and bad jokes, with a big bucket of sentiment thrown in for the climax. Watch the songs for a bit of colour and movement and avoid the rest. Luckily? the film is on youtube with subs so I didn’t have to buy another DVD that ends up as a drinks coaster or bird scarer. I’d still like those hours of my life back though. I suppose I have to give a rating … 1/2 a star – just for the song picturisations which are mildly diverting. This entry was posted in Tollywood and tagged Ali, Arjun, Arjun Sarja, Brahmi!, Dinesh, Hanuman Junction, Jagapathi Babu, Jaya Prakash Reddy, Kovai Sarala, Lawrence, Laya, M. Raja, M.S. Narayana, Rallapalli, Sneha, Sriram L.B., Suresh Peters, Venu Thottempudi, Vijayalakshmi. Bookmark the permalink. Thats not rallapalli… i think hez Paruchuri venkateswar rao…..
I’ll go edit that now! Yes – you actually recommended this film to me in India last year. I thought it was pretty funny and I really liked Sneha and Arjun. This is one movie which sometimes appears very engaging…and at other times not even a bit! Maybe some movies are made this way…anyway, nice and contrasting reviews on the movie Heather and Temple…I love reading your reviews! Comedy is very subjective and usually I don’t find these films amusing at all, but this was an exception and I did enjoy it. As you say, it’s a bit patchy but the interactions between Krishna and Dasu and also between the brothers and Meenakshi and Sangeetha were generally good. I have a few more on the ‘comedy’ pile that I’ve put off watching but after this was better than expected I may get round to watching them sooner rather than later. Ladies, did you watch Bhookailas ? If yes, wheres the review ? I’ve watched it and it is a favourite of mine 🙂 It’s on the list & will get a review in due course. Wow ! I found a legal and subtitled version of choopulu kalisina subhavela on youtube. Thanks for the recommendation Hari.